"These allegations are wrong. Perhaps, Kolomoysky stands by Zelensky. I have known Kolomoysky for a long time, and he is very favorably disposed towards me," Saakashvili said. He said he intends to return to Ukraine if Zelensky wins the election. "I adore Ukraine, I will definitely come back and restore my Ukrainian citizenship," Saakashvili said. He said he had no intention to take any positions, including the one of prime minister, in Ukraine even he was offered to, but was prepared to give "substantial assistance." 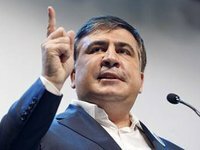 "My plans are linked to Georgia," Saakashvili said.